Coined by the late writer Harris Wittels, the word “humblebrag” is used to describe an instance of “false modesty.” People humblebrag when they don’t want to annoy people with an overt brag, but a team of researchers from Harvard have just discovered that those attempts at humility actually do more harm than good. As reported by New York Magazine, the paper (entitled “Humblebragging: A Distinct – And Ineffective – Self-Presentation Strategy”) details five experiments conducted by the researchers, and concludes that people are more annoyed by humblebrags than both complaints and your standard, run-of-the-mill brags. In one [experiment], they asked 302 people to imagine the person who said one of three statements: a complaint (“I am so bored”), a brag (“People mistake me for a model”), or a humblebrag (“I am so bored of people mistaking me for a model”)...Overall, the study participants liked the complainers the best, and then the braggers; in last place, perhaps not surprisingly, were the humblebraggers. But humblebraggers weren’t just liked less, they were also perceived to be less attractive. In addition to asking people how much they liked a subject, one experiment asked them to rank the subject’s perceived sincerity and attractiveness on a scale of 1 to 7, based on one of two conditions. You can probably guess the outcome. 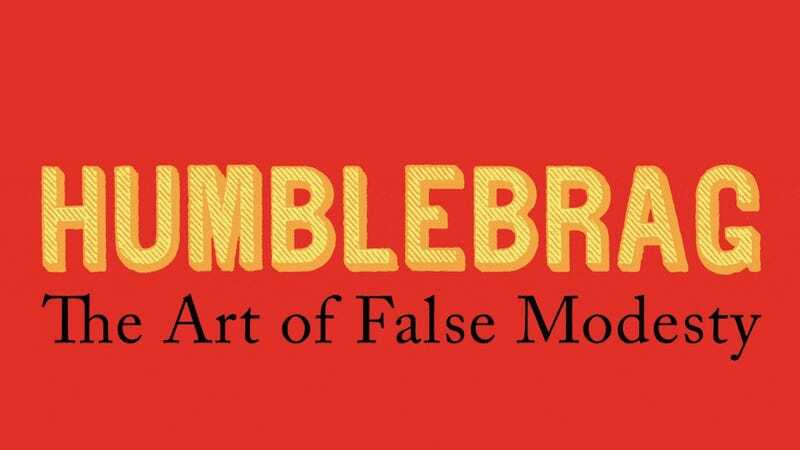 So not only are humblebraggers less likable, they’re less hot. A sixth of a point less hot! The paper concludes with a final warning to all humblebraggers. The proliferation of humblebragging in social media and everyday life suggests that people believe it an effective self-promotional strategy. Yet, our results show, people readily denigrate humblebraggers. Faced with the choice to (honestly) brag or (deceptively) humblebrag, would-be self-promoters should choose the former – and at least reap the rewards of seeming sincere. So if you’re going to brag, just brag. Or just shut your mouth and don’t risk that sixth of a point.